The other day in the car Halley asked me if I had heard of St. Baldrick's (I hadn't), and proceeded to tell me about a boy in her class that is shaving his head for kids with cancer, and how nice he was to want to do that. Then the conversation turned to Jessie and her Joy Jars, which turned to talking about heaven, and what their sister might be doing right then. I had an idea in the back of my mind, and that little request was just the little nudge that pushed me into my computer chair, headphones on, Kings Kaleidoscope blasting, rainbow designing. Vanessa is the brave mama of Brock who has fought cancer. Her story and his strength ruined me. Her heart to help fund childhood cancer research inspires me. On March 24th Vanessa, along with other mamas, is SHAVING HER HEAD. All with the common goal of equipping St. Baldrick's in their research efforts to treat and end childhood cancer. 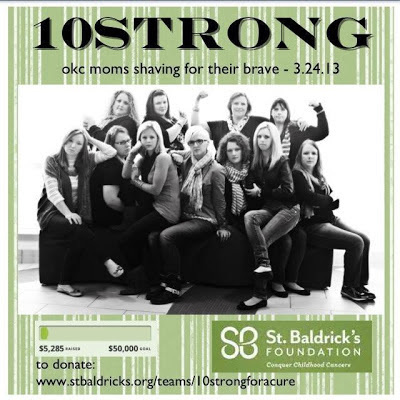 This video... please, pretty please, watch it to see what St. Baldrick's is up against. What they hope to do. I can think of way too many kids who have faced cancer, battled and won, or battled and been called home. I am so thankful for this opportunity to help in some small way. This happy sign made by Salty Bison, that I scooped up at Queen Bee Market last year (be jealous), greets me as I make toast each morning. It might be my most favorite thing in our entire kitchen. The quote is so true. Sometimes it takes a little rain to make a rainbow. Sometimes it takes storm upon storm upon relentless storm. Half of the sales from this print will go to St. Baldrick's as Vanessa and her team as they bravely march toward their goal. Join me in prayer and support of these mamas as they fight along side their children and St. Baldrick's to end childhood cancer. I love this so much. And I finally had the chance (ok, remembered) to buy the red Hope for Sudan sketch for my boys room. Love these messages. Thanks for sharing. I am wrecked. 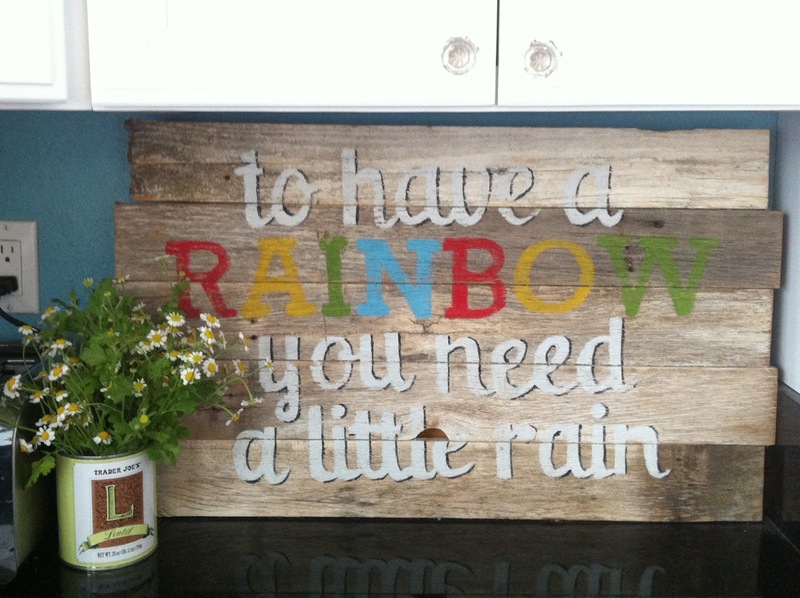 The sign, the rain, the rainbows. Ordering the print. Inspired. Thank you so much for helping us! You're rad, Julie Carson. Rad. 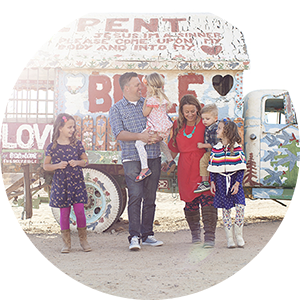 Just found out 2 wks ago that our good friends here will be walking through leukemia with their precious 6 yr old daughter. SIX. Intense and heartbreaking to say the least. Such bravery and trust. Thanks for being a part of this amazing project- the St. Baldricks event was last weekend here and they are doing BIG things. Good job highlighting this important event and reminding us to pray. And for sharing your rainbow. If that kitchen sign goes missing next time I'm in CA, well... sorry. my niece is a cancer survivor! she had a heart transplant at 9 days old and got cancer from her anti rejection meds. she almost died 1 1/2 ago, but God miraculously healed her. praise Him! "parents will be planning birthdays instead of funerals..." and i'm done for. Thank you for giving as you do. Off to go buy a print. This is wonderful! I don't know that I would be brave enough to shave my head. And the quote...perfect. I very frequently pray for rain because I know that it is God growing me. 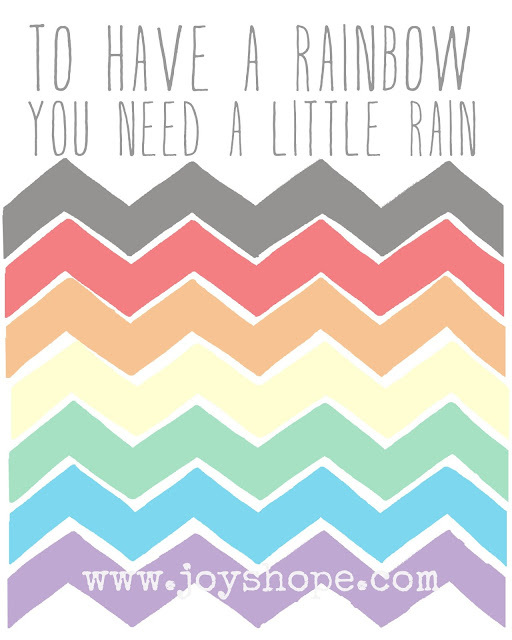 Sometimes I don't like the rain that comes but in the end there is that rainbow. Beautiful. hey! I just realized the design was different. I like it!! Thank you for sharing this! I shaved last year with st baldricks (as did my entire family... about 15 of us)... my 6 yr old niece has been fighting cancer for five years. St Baldrick's is the place to go when you want your money to actually go to research! :) Thanks for spreading the word!